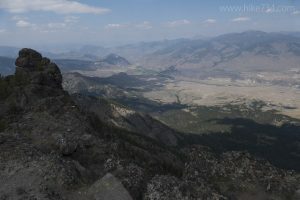 Perched high above Mammoth Hot Springs and Gardiner, MT, Sepulcher Mountain provides great panoramic views. This loop starts at the Beaver Ponds trailhead next to the otherworldly, travertine landscape of the Mammoth Terrace. The trail enters the trees and climbs in a mature forest. The Beaver Ponds Trail splits off to the right as this trail continues to the left. As it climbs, loosely following Clematis Creek, it provides limited views, but nice forest birding. Occasional meadows transition to large, open meadows. The views become wonderful as you gain more elevation. Interesting rock formations break up the landscape, and the occasional stand of trees provide some shade along this mostly southern facing slope. A series of tight switchbacks take you to the top of a grassy ridge looking into another drainage. The trail traverses inside of the bowl and down into the trees denying you, for the time being, of views to the north. The trail continues through dense trees along the ridge with occasional views, until finally breaking out to great views to the north along a steep cliff. The gnarly boulders on the cliffs create a wonderful, distressed landscape. The views are vast as you look down onto the rolling landscape, from the Beaver Ponds below, out to the Yellowstone River, and the town of Gardiner. The trail follows this rocky ridgeline out to the sepulcher like rock formation that gives this mountain its name. Here, there is a small spur trail leading to a great viewpoint and the perfect spot for lunch. After the spur trail, return to the main trail that continues a gentle climb near the actual summit. Impressive Electric Peak dominates the epic landscape as you traverse the west ridge. 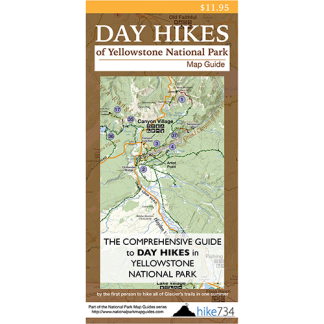 The trail begins to descend on an expansive, grassy ridge. Unobstructed views to the south are a feast to the eyes, and the grassy meadows are a great place to spot elk. The trail eventually drops into some trees and joins up with the small, but beautiful Glen Creek. Glen Creek goes from a slow, snaking creek to a chattering creek as it bubbles through a cooler, narrowing draw before popping out into another broad meadow. Take a left as you enter this meadow on the Snow Pass Trail which traverses the edge of the meadow, then gently goes over Snow Pass. It then drops steeply through trees to the valley, down to the Howard Eaton Trail. Take a left at the trail junction and continue through the trees with limited views until you come to an open area dotted with trees and hydrothermal features. The trail continues on where you’ll encounter cars driving the loop around the Upper Terraces area. The trail stays to the left and follows along the edge of the terraces, giving you unique views of the great, white, travertine features of the Mammoth Terraces. It then rejoins the Beaver Ponds Trail on which you started. Trailhead: The sign labeled “Sepulcher Beaver Ponds” is at the south end of the parking lot labeled “Restroom Parking”, near Mammoth Terrace.